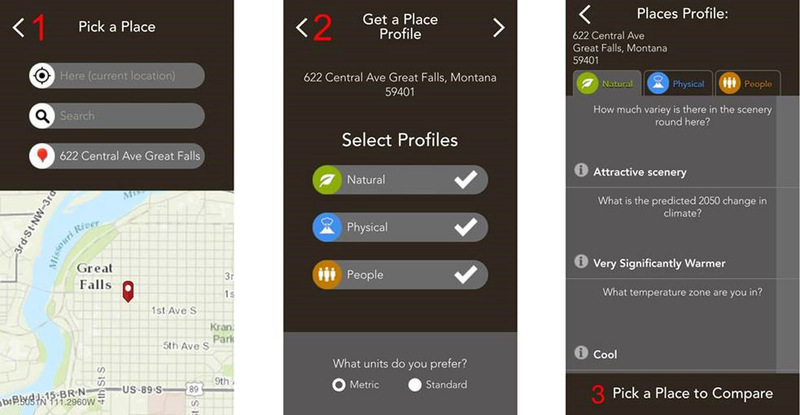 Available for iPhone and Android, Field Notes—Earth lets you pick a place (left), pick your profiles (center), and get results about your place. Redlands, California—Smartphone users now have access to Field Notes—Earth, a new mobile app from Esri that employs the power of geography to answer questions about locations throughout the world. Built using Esri’s AppStudio for ArcGIS, the free app allows anyone to discover interesting facts about population, nature, and physical landscapes for any location on Earth. With an intuitive design available on Android and iOS devices, the app gives users the option to discover answers to questions about their hometown, current residence, or any place of interest. It lets them compare these findings to an additional location. After selecting an initial place via current location, search, or by dropping a pin on a map, the app reveals geographic insights for three categories—Natural, Physical, and People. Sample questions include: How crowded is it in this location? How close am I to a recent earthquake area? What is the predicted 2050 change in average temperature? And much more. “Whether you are relocating, are an educator looking for a new teaching resource, or just curious about the world around you, the app reveals insights into the complexity of humanity’s relationship with Earth for everyone to enjoy,” said Sean Breyer, ArcGIS content program manager at Esri. In addition to exploring 18 questions, users can click on any answer for more details and to learn how the selected locations relate to the rest of the world’s landscape and populations. The app reveals, for example, that the majority of people live in very hot climates and more than 40 percent of the Earth’s soil is poor for most crops. Field Notes—Earth utilizes maps from Esri’s Living Atlas of the World, including the World Ecological Land Units map that shows the Earth’s complex ecosystems; the new World Seafloor Geomorphology map that reveals the complex role oceans play in Earth systems; and the World Population Estimate map that shows where people live. Esri’s Content Team created the app using AppStudio for ArcGIS, which lets you build an app once and have it automatically ready for Android, iOS, Windows, OS X, and Linux. The app is available for free download in the Apple App Store and Google Play.